The Oregon Constitution had no provision for the death penalty when it was enacted in 1857. But in 1864 a statute was passed declaring the death penalty for first degree murder; from then until 1903 county sheriffs had the responsibility to carry out executions. The Oregon Legislature in 1903 amended the law to require executions to be carried out at the Oregon State Penitentiary. Harry D. Egbert was hanged at the state prison for the murder of Deputy Sheriffs John G. Saxton and Joseph West. In Wild Horse Valley, Harney County, last October. The drop of six feet from the gallows broke the condemned man’s neck and in nine minutes and 18 seconds he was pronounced dead by Doctors J. D. Shaw and E. A. Pierce. According to The Oregonian, 27 year old Mr. Egbert was originally from Audubon County, Iowa, and his real name was John H. Frost. He began his life of crime as keeper of a “blind pig” in a prohibition town. In 1901 he served a sentence for horse stealing. In 1903 a warrant was issued for his arrest for burglary in Drain, Oregon, and when deputies arrived to arrest him he shot and killed them. 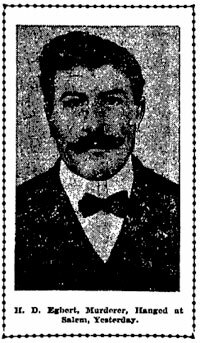 He was found guilty of murder in the first degree and sentenced to death in December, 1902.